a) “DSL” means Domestic Shipping License as define under Part IIB of MSO 1952.
d) “Applicant” means a company registered and incorporated in Malaysia, as defined under Part IIA of MSO 1952.
e) “Owners” means a person or a Malaysian company that owns Malaysian Registered Vessel. g) “Secretariat” means the employee of MASA responsible for processing the DSLE. 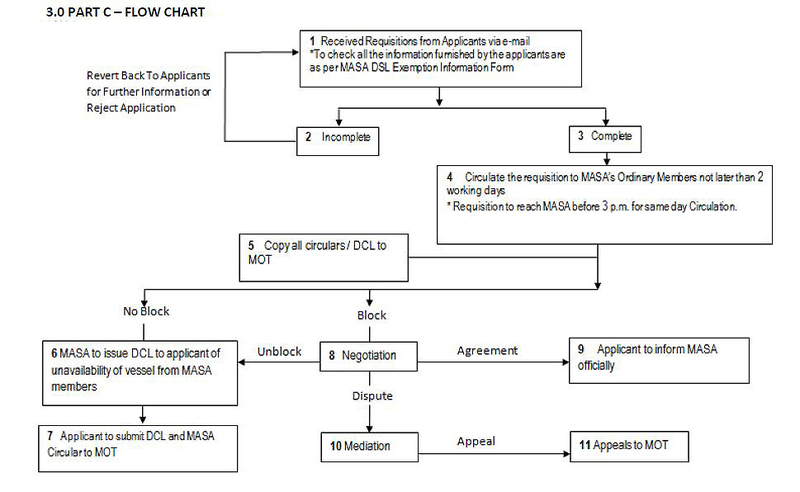 h) DSLE Consent Letter (DCL) means the letter of consent issued by MASA to applicant, stating that there is no suitable Malaysian Flag Vessel available for the requirement. i) “Circulation” means the action by MASA to disseminate by email the Applicant’s application. j) “Block” means, DSLE application is challenged as one or more Malaysian’s Flag Vessel(s) can be offered to meet Applicant’s requirement. 1.2.1 This SOP shall become a standard guideline for MASA, Applicant, and Owners for the application of DSLE. 1.2.2 DSLE is to allow Foreign Flag Vessel (s) to engage in domestic shipping. 1.3.1 Applicants shall inform MASA clearly on their job requirements for the purpose of the DSLE. 1.3.2 Applicants must not have any foreign vessel pre-contracted for the job. 1.3.3 Applicants shall be responsible for the accuracy of their declaration. False, inaccurate, or incomplete declaration will cause DSLE be denied. 1.3.4 Upon receipt of the complete application form, MASA shall circulate the application via email to members. 1.4.1 Every application, including renewal of expired DSL shall be treated as a new application. 1.4.2 Upon circulation of the application, any additional requirement or information by the applicant shall be treated as a new application. 1.4.3 Application must be forwarded to MASA a minimum of five (5) working days in advance but not more than four (4) weeks before the commencement date of the contract, or upon DSL expiry. 1.4.4 For specific type of vessel Form A, B, C, or D to be used. For other general type of vessels, use Form E.
1.4.5 One (1) application form per vessel for all types of vessel including Tug & Barge. 1.5.1 Circulation is valid for two (2) working days. Application received before 3pm on a working day shall be circulated within the same day. Application received after 3 pm shall be circulated on the next working day. 1.5.2 Incomplete application will not be circulated and any wrongfully declared information will not be circulated and considered as null and void. 1.5.3 Records of all circulations shall be kept by the MASA Secretariat. 1.6.2 DCL to be issued after 3.00 pm on the 3rd working day. 1.7.1 All blocking shall be made within the validity period of the Circulation. b) Non-compliance with the technical specification (should be mediated by Mediator). a) If an Applicant does not respond within two (2) working days after the last communication, the application is deemed null and void. b) If an Owner does not respond within two (2) working days after the last communication, DCL will be issued to Applicant. c) Blocked application is not allowed to submit similar application for 3 months period from the date of block. The condition is when the applicant that abuses clause 1.7.4 (a) and shows no interest to even consider hiring Malaysian flagged vessel by not replying / engage with a communication to the party that offered its Malaysian vessel, instead will resend same application again to MASA. 1.7.5 In the event of a Block, Applicant and Owner shall liaise directly with each other. All communications shall be copied to MASA and MOT. 1.7.7 Any declaration of availability of a Malaysian Vessel after the issuance of the DCL will not be entertained. 1.8.1 The mediation will be chaired by a Mediator from the Marine Department. An Officer from the Ministry of Transport Malaysia (MOT) shall be present. 1.8.2 The Mediators shall be approved by MOT. Mediator may call upon third party expert/s from the industry for consultation. 1.8.3 Records of mediation shall be submitted to MOT. 1.8.4 Disputes relating to charter rate will be decided by MOT and /or Marine Department upon consultation during the mediation session. 1.8.5 Parties involved in the mediation may bring in their experts and/or documents. 1.8.6 Failure of any party to be present in the mediation will result in the decision favoring the other party. 1.8.7 Any party who is dissatisfied with any decision may appeal to MOT within 2 days after the mediation where decision is final. ii. Charterer to confirm the report. Bunkering is defined as the transfer of bunker fuel from cargo tank of supplier vessel into a bunker tank of a recipient vessel. a) Bunkering Permit/Approval issued by a Port Authority/Marine Department where applicable. Applicant of foreign flag bunker vessels to be engaged in providing bunker services can have at any one time a maximum number of three (3) vessels. Applicant will only be entitled an aggregate period of twelve (12) months of hiring of any foreign flag vessels after which the vessels are restricted from plying in domestic waters. Cargo Vessel is defined as any vessel that carries specific type of cargo. g) Any other vessel that carries cargo. a. All applications are to be made using Form B.
b. Issuance of DSL shall only be on Voyage Charter basis, with the exception of vessels with Time Charter contracts. g) Any other vessels that support offshore, Oil & Gas industry. All applications are to be made using Form C.
a) Tugs and barges engaged in offshore, oil & gas industry shall use the Form C.
b) Tugs and barges not engaged in offshore, oil & gas industry shall use the Form D.
c) For Harbour Tugs required to operate in port limit, Port Authority/Marine Department to give a letter of support for the application and stating that there are insufficient tug to operate inside the port limit. a) Applicant shall indicate potential / candidates vessel name in the provided form. b) Only the type of vessel shall be specified. a) Specific job description shall be specified. a) Actual loading discharging port of the vessel shall be specified. a) The dimension of vessel should be specified in a reasonable range (maximum and minimum). E.g. : Length: 110meter to 120 meter. b) Other descriptions shall be specified such as BHP (bollard pull), draft, etc. c) Applicant shall provide / declare charterers details and agent’s details in the DSLE application Form.